This article will deal with two aspects: handling the regular sounds which are accessible in Control Panel as well as changing the system startup sound, which is hidden inside a .dll file and quite tricky to get at. The regular sounds can be accessed by entering the Control Panel and browsing to Control Panel\Hardware and Sound\Sounds\Change system sounds. A window with selectible sound schemes will open where you can either select a premade scheme or browse your files to choose other .wav files and save a custom scheme. The checkbox below the list already indicates that you will not find the Startup sound in it - you will need third party software for that. 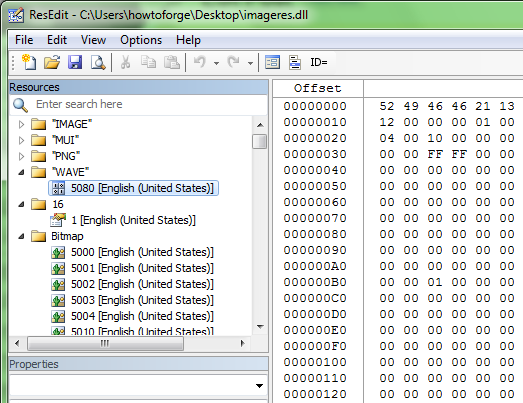 In ResEdit, open the copy of imageres.dll you saved to your desktop. On the left Resources column, find the "WAVE" entry - there is exactly one file in there, which has different names depending on your system language - I'm using American English, which is why it's called 5080 here (replace any occurance of that number here with the one you have for your language). To be able to import your own sound, it also must be in the .wav format and must be called the same as the file you just found. Now delete the 5080 entry in ResEdit - right-click it and choose Remove from project. Then right-click on some empty space in the Resource column and select Add Resource... > User Definded. A window pops up - select Name identifier and type in WAVE. Now browse the sound file you want to configure as startup sound and hit Open (I don't know the maximum size of the file you can use, you might try to keep it as small as possible - it worked for me with a file size of ~90kb, others have reported more). It will have the wrong name and language defined after you import it, so you have to change that: Right-click the entry and select Rename. Leave the Ordinal identifier checked and enter 5080 into the identifier box, then select the correct language for you (Englisch (United States) if you had 5080) and hit OK. Afterwards save the file in ResEdit. Now comes the tricky bit which is replacing the imageres.dll in your System32 folder with the one you edited. If you try to just do it, Windows will most likely hit you with the Permission-Denied-club, no matter how many administrative rights you have got. People have reported that it worked for them in save mode. A save option however is to boot off a Linux Live CD (I used Linux Mint 12 Lisa) and replace the file in the Live environment. Therefore, just download a CD image file from here or any other Linux distribution's homepage, burn it onto a bootable CD and boot from it. You will boot into the Live environment, from which you can test and install Linux or if you need, fix stuff on your Windows installation. I will go on with the instructions assuming you chose Linux Mint 12 from the link I provided, if you chose differently you will likely know how to accomplish the next steps on your system. The file is now replaced and you can reboot, removing the CD when told to. If you encounter problems with the new imageres.dll, just repeat the process and copy the backup you made to the System32 folder instead. good entry. I like your Resource editor better. This way you can store any custom imageres.dll and then just run a script for the novice user.